Friends and colleagues were saddened by news of the death on May 23 of genetic toxicologist Heinrich Malling, Ph.D., the University of North Carolina-Chapel Hill Medical Center, at age 85. Malling retired in 2004 as head of the NIEHS Mammalian Mutagenesis Group, following 32 years of service to the institute. “He was a major a figure in genetic toxicology who advanced the field with many discoveries, including his work on alternative models for the study of mammalian mutagenesis,” said NIEHS and National Toxicology Program (NTP) Director Linda Birnbaum, Ph.D.
A native of Denmark, Malling completed his Ph.D. at the University of Copenhagen in 1957 and worked at the multi-national drug maker Leo Pharma, before beginning a postdoctoral fellowship in 1958 at the University of Copenhagen Institute of Genetics, where he later worked as an assistant professor. While still in Denmark, Malling began working with the Neurospora fungal mutation system, developed by Frederick deSerres, Ph.D., at Oak Ridge National Laboratory in Tennessee. In 1963, Malling joined deSerres at Oak Ridge, then moved to NIEHS in 1972. Results of research by deSerres, Malling, and others pointed to important implications of mutagenesis in human health and disease. In 1969, Malling and deSerres joined mutagenesis giant Alexander Hollaender, Ph.D., and others to found what is now known as the Environmental Mutagenesis and Genomics Society. With colleagues at Oak Ridge, Malling developed microsome preparations that were later used by NIEHS grantee Bruce Ames, Ph.D., in the development of the famous Ames test for mutagenicity, one of the first alternative models used in toxicology. 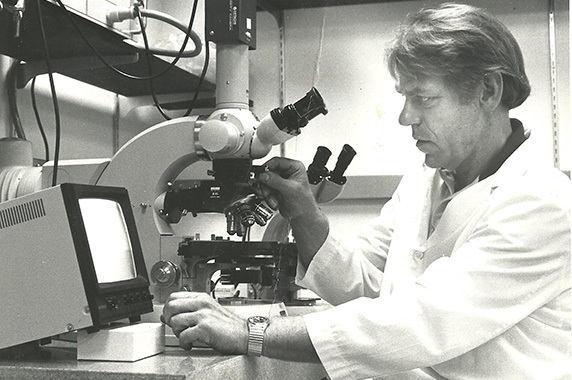 Breakthroughs by Malling and Ames in the early 1970s were credited by NIEHS and NTP Director David Rall, M.D., Ph.D., and colleagues for helping set the stage for later efforts to advance alternatives to testing methods that used rodents. Malling was also a member of the Ecological Toxicity and Alternative Models group, which formed at NIEHS in the early 1990s. While at Oak Ridge, Malling organized the Environmental Mutagen Information Center. He and his laboratory technician at the time became proficient in their knowledge of specialized information centers, the precursors to today’s powerful databases. At NIEHS, Malling pursued his research despite colleagues who maintained that transgenic systems would not work, because viruses had toxic DNA sequences that would kill mammalian cells. Malling persisted with the mouse model and went on to develop transgenic fish and earthworms to serve as monitoring systems for other segments of the biosphere. Citations: Malling HV. 2004. History of the science of mutagenesis from a personal perspective. Environ Mol Mutagen 44(5):372-386. Rall DP, Hogan MD, Huff JE, Schwetz BA, Tennant RW. 1987. Alternatives to using human experience in assessing health risks. Annu Rev Public Health 8:355-385.
next article - "Ten postbacs represent NIEHS ..."